I don't venture much down to Los Gatos usually, but for a two Michelin star restaurant, any time. There are only 2 two-Michelin star restaurants on the San Francisco peninsula. One was Baume which I have covered before. The other one is Manresa. Both are really quite good. 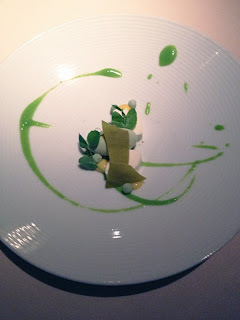 For restaurant setting, Manresa definitely has Baume beaten hands down. Food wise, I think Baume was slightly more consistent. But of course this is all very subjective since both are just wonderful. In either case, let's just say I would not mind to dine at Manresa nightly. Everything I had was done expertly and precisely. Presentation was on point and nothing I had cause me to think what were they thinking. I even got my frozen pea ice cream dessert that is reminiscent of the one I had at Meadowood Restaurant that I loved so much. All in all it was delectable meal that I would not hesitate to recommend to anyone who's traveling to or live around San Jose (or for that matter, SF bay area). Can't see Stars in NYC? Check this out! How do you make a soft and flowy building?